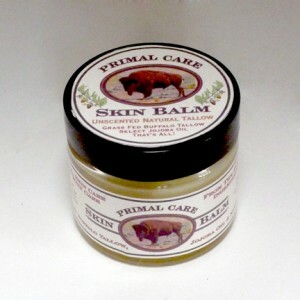 Primal Care Skin Balm relieves and restores dry, cracked skin and lips, callouses, abrasions and minor burns. It is totally natural and biologically compatible with your skin. Absolutely no petrochemicals! Unscented Tallow shown. Also available in Taos Pines, Desert Garden, and Facial Blend fragrances. Read our article in Mother Earth News!